Mom, dad, I want a motorcycle please - Motorcycle Safety Institute of S.A. So, you think it is time to experience what you’ve only seen from the inside of a car or in a movie? You also believe that it is mission impossible trying to convince your parents to get you one. Well, let’s put a flashlight on this, and maybe it’ll help serve both sides of the fence. It is true that some parents are eager to get their kids on a motorcycle before they’ve even learned to walk, and others swear on their ancestors’ graves that they’ll do whatever it takes to keep their children away from this “dangerous” lifestyle. Lucky for me, my parents had no real issues with me riding a bike in and around the mining community outside Rustenburg when I started riding at a very young age. So, here you are. You’re young and itching to throw a leg over a bike and feel the wind on your face and experience the excitement it brings. Maybe you’re frustrated after having just been told by your parents that you’re to never consider bringing a motorcycle home while living under their roof. Sounds familiar? Well, for some of you at least. We were all there once, so consider these steps if you want to end up becoming one of us. Before you go anywhere or do anything, first sit yourself down and learn to accept the fact that riding motorcycles can be very dangerous. Any way you twist it, you won’t be able to get away from the fact that this lifestyle requires agility, focus, and discipline. Any other version of that truth you might try and convince yourself of is incorrect. The important thing to take away from this is that proper understanding of how and where a motorcycle operates, and the potential risks of the environment you’ll ride in will help lower your chances of ending up a statistic. Yep, there’s homework involved. Look up the statistics that surround motorcycle crashes. Do some searching and see what you uncover in terms of how much motorcycle technology has advanced in the past 10 years alone. Traction control, ABS, it’s all there to make the experience (and you) safer. 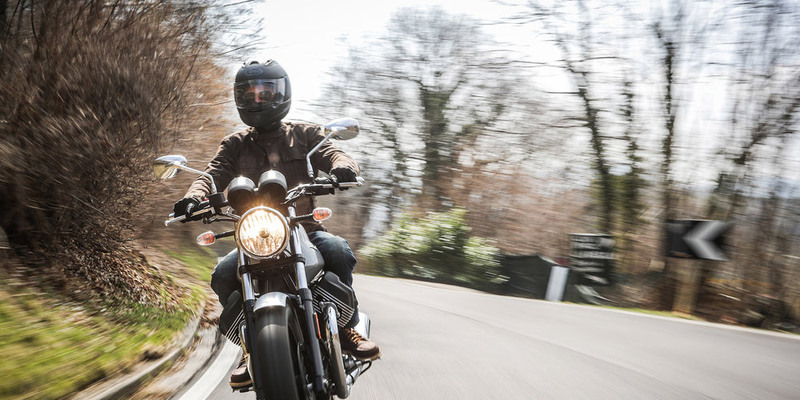 You might be surprised to learn that motorcycles are also very fuel-efficient, thanks to their power-to-weight ratios—great for commuting back and forth to school or varsity and finding parking at crowded places. Here it is: If you’re trying to ride to show off or impress someone else, you’re not in this for the right reasons. A bike can be a personal statement all by itself; it doesn’t need you attempting to help it along by fantasizing about popping a wheelie in the school parking lot or racing that GTi to the next stop light. It only takes one serious mistake, so if you’re prone to say “Naaah” to caution, learn how to properly keep a handle on your ego and shrug off reckless behaviour. One of the most common things I see while out riding is the lack of proper protective gear among riders. I get it, it’s your choice (a choice not to think), and if you want to wear flip-flops, baggies and a “help my sterk lyk hempie” (in other words, a squid), be my guest—just don’t expect your parents to be on board. Well, unless they are of the same careless mindset of course. Instead, try talking to someone at a motorcycle gear and accessories shop about different types of helmets, gloves, jackets, boots, etc. You’ll be amazed at the variety of what you’ll find—and you’ll learn a thing or two. Having the correct gear and taking the time to research safety ratings will show that you’re committed to making your experience a safe one. As with anything, practice makes perfect. The help is out there, and one of the biggest turning points in my pursuit was signing up for motorcycle rider training. Here is where you’ll learn the basics. Most motorcycles have manual transmissions, which can be tricky to learn if you’re not already familiar with how they work. The job of the riding instructor is to help you understand how inputs from the rider affect the bike, as well as training in the safety of a controlled environment. Even if you already know how to ride, a basic rider course can help you master some of the more difficult manoeuvres and many of my friends and students left much better riders after taking Basic, Intermediate, Advanced and Skilled courses later in their riding careers. Often, insurance companies will offer unique benefits to those who complete an Advanced Rider Course. Here’s where things get interesting. I know a lot of talented riders who started out riding a scooter or small motorcycle before moving up to something larger and more powerful. If you’re allowing yourself to be pressured by your friend who tells you that you’ll be “bored” with a 250cc, or that a scooter is for girls, ignore them. I don’t care what their argument is, we’re talking about you, not them. There are benefits that simply cannot be argued with about starting small, and if it means you’ll have to stick with a 150cc scooter while you’re learning to handle a two-wheeler in traffic, then so be it. At least for the first 6 to 8 months to a year. Pace yourself! Understanding when to discuss this with your parents is key. You don’t want to come off as impatient, aggressive, or a know-it-all. Take their feelings into consideration and be sure to take what they have to say to heart. Sure, you’ve got a goal in sight and you won’t stop until you make it there, but you need to understand that these things take time. Don’t expect your parents to change their mind overnight. They have their reasons, or they may have experienced the trauma of losing a friend or family member in a motorcycle crash. Seeing things from their point of view and being open to their feelings on the matter can help establish a stronger line of trust between you. Remember, don’t rush it or get anxious, it will not end well. Very important though, when you get the “Yes”, stick to the plan – get the gear and most certainly get the training, then ride with the required discipline and vigilance – Ride to Live!